We will be sharing interior design tips and tricks for fellow interior designers, as well as the do-it yourself'ers working on your own home and business projects. Coming soon: Videos and how to's with before and after pics on our site and in this blog. These are cool new features coming to you from H2E Interior's, you are not going to want to miss this! Sign up and follow us on our blog, or visit our website and keep up with all of our new fun and exciting ideas! 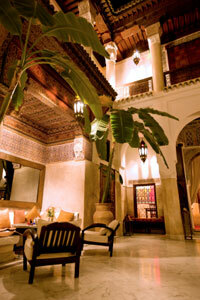 We are an Interior Design company in Phoenix, Arizona. We specialize in residential and commerical design projects all over the United States. Does the summer weather have you longing to spend more time outdoors? You want to make the most of your yard and enjoy it to the fullest. 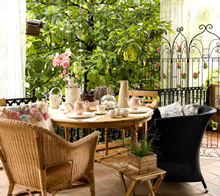 This month, we send you the scoop on decorating your outdoor space, so it is as beautiful as your interior. Our Color of the Month is SILVER – a beautiful accent color for outdoor living. Decorate your season with a splash! Your yard is an extension of your interior, and it needs to support your lifestyle if you want to make the most of it and enjoy your space to the fullest. 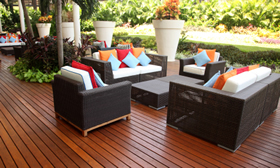 Create an outdoor area that echoes the comfort of your own living room. Do you want a tranquil retreat?An elegant entertainment area?A classically formal space? Get clear on your goals, and designing your outdoor space will be easier. If you like to use your yard to escape and relax, keep your colors neutral. Colors that suggest nature – ocean, forest, mountains – will soothe and relax you. Choose soft shapes for your furniture. Do you love to entertain? Make sure you have plenty of comfortable chairs and lots of areas to serve. Position seating in L- or U-shapes to promote comfortable conversations. Use umbrellas to create shady areas. For a formal space, arrange your furniture in a symmetrical pattern. Use classic shapes. 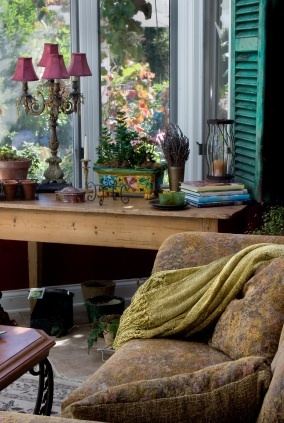 Keep bright colors confined to pillows and accessories so they can be easily updated as your tastes change. Good lighting is crucial in every outdoor space. For safety, be sure toilluminate driveways, paths, stairs, pool areas, and dark corners. You can add visual interest by highlighting outdoor structures. Attach string or net lights to trees, bushes, trellises, sheds, and arbors. Float candles in birdbaths, pools, or ponds. To add more comfort, decorate with accessories that are traditionally reserved for indoors. Look for mirrors, frames, rugs, and fabrics that are water-resistant and created for use outdoors. Silver is a beautiful color for summer. Use it inside and out. Silver works for contemporary homes, as well as traditional styles. Mix silver with deep, bold colors for a dramatic, confident look. Combine it with soft blues for a soothing, rich feeling. Pair silver with tan for a timeless, sophisticated elegance. Being a relative of gray, silver is associated with strong character. It is said to enhance patience and perseverance, drawing negative energy out from the body and replacing it with positive energy. The trend for the season is to add splashes of color, and silver is a great addition for bringing out your colorful accents. While it may be a nice dream to transform the whole house and redecorate for every season or holiday, the truth is that most of us don’t have the time or resources. But we still want a festive look in our homes. The good news is that it only takes a few small, well-placed accessories to create a completely new look and evoke the joyous mood of the season. Enjoy the ideas in this month’s article, and enjoy your holiday season! Creative holiday decorating isn’t about spending lots of money. It’s about using your imagination and adding your personality. Before you run out and purchase expensive accessories, look around your home to see what you already have. Chances are that you have everything you need to create your own unique, personal decorations. Dress the chairs. As you get ready to dine with friends and family, think beyond traditional table décor. Adding glamour to your chairs is a simple way to create a big effect. Get creative. Tie a winter mitten to the back of a seat and use it as a “vase” for flowers. Holiday ribbons tied with pine cones are a classic holiday look. 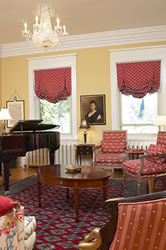 Create “custom” window treatments. Have fun creating your own personal treatments for the windows at holiday time. Ideas? Hang paper snowflakes from invisible wire so they hang at different levels across the window. Swag garland from the top corners. Create illuminated valances by hanging a string of icicle lights from the top of each window (there are window-sized sets made specifically for this purpose). Spruce up the entryway. A festive entrance will create the perfect first impression. 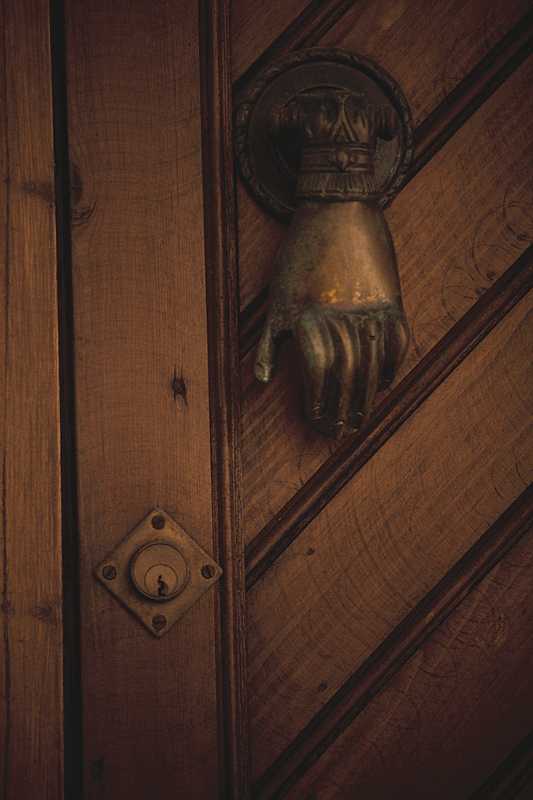 What can you do to surprise and delight guests as they walk in the front door? A floor mat in seasonal colors welcomes visitors with holiday cheer. Fresh flowers always add comfort and brightness. How about hanging decorative ribbon from the entry chandelier? Got candles? Take wide pillar candles and wrap them in ribbon, flexible twigs, or thin garland. Arrange candles in groups of three to create a lovely holiday display on any table. When guests are visiting, light the candles and turn down the lights for a warm, holiday atmosphere. Go for a color! 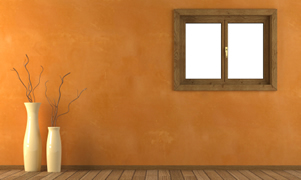 By simply decorating an area with all the same color, you can create a cheerful air. If you have guests coming over, use a red or blue tablecloth, and match all the napkins and table décor in the same color. Then add gold or silver accents to bring the holiday mood alive! Create a centerpiece. A simple holiday centerpiece will inspire a cheerful, festive mood. Grab a large container, and fill it with colorful fruit or flowers. Use a flat platter to display metallic ornaments. Or create a “gift centerpiece” for extra excitement and color. To make this centerpiece, wrap small, empty boxes in holiday paper or in colors to match your room’s décor. Decorate each box with ribbons and bows. Then place the “gifts” in a decorative container, or arrange them in the center of the table with fresh pine greenery. 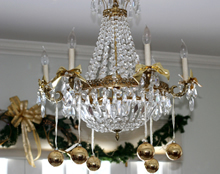 You may be amazed at how easily and quickly you can add holiday cheer to your home! Add a touch of luxury to any room with metallic color. Metallics enhance a space with light and depth, creating a warm, cheerful feeling. Walls: Liven up a room by covering your walls in a metallic paint. You can get metallic paint in almost any color. Paint all the walls to immerse yourself in lavish splendor. Or use a translucent metallic glaze over your existing paint to simply add a pretty luster. You can also create one beautiful accent wall. Metallic wallpaper is another way to glam up your walls. They come in many patterns, colors, and textures, and will add depth and excitement. Ceilings:Inject a dramatic punch to a room by covering the ceiling in a metallic paint or wallpaper. When light is focused up toward the ceiling, it glows beautifully and enhances the room with richness and dimension. Fabrics: Nothing says luxury like metallic fabrics. A little bit goes a long way. 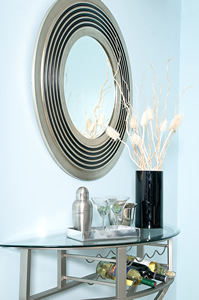 Accessories: Accessories are the quickest way to add metallic color to a space. Introduce a few pieces, and you’ll have a fresh look. Replacing cabinet hardware with metallic knobs is one of the simplest ways to transform an entire room. As the winter slowly creeps towards us, we have a natural tendency to spend more time in our homes. And what better way to warm up than to sit around the fireplace? This month’s article gives you inspiration for decorating the mantel and the space above your fireplace. And check out our Color of the Month for a great hue that will warm you up and help you feel cozy throughout the entire season. Decorating a fireplace can make a huge impact on a room. Because the fireplace is often the focal point of a space, make sure you treat it as the special piece that it is. Before decorating your fireplace, look at the rest of the room. 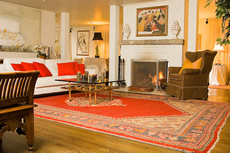 The style and colors of your furnishings will determine the direction for your fireplace décor. If the room is contemporary, stick with straight lines and sleek accessories for the mantel. For a cozy, traditional room, you can add softer lines and a grouping of collectibles. Often in contemporary rooms, the fireplace doesn’t have a mantel, and you only need to determine what artwork you want on the wall. But in most cases, you’ll need to consider décor for the mantel and the wall above. These are two distinct areas, and need to be treated with different types of coordinating accessories. Common mantel accessories include candlesticks, vases, and greenery. Of course, whatever you use should support the style of your room. To create visual interest, vary the size and elevation of the objects you choose. 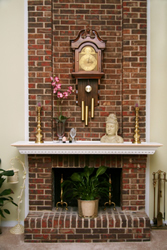 The area above the mantel is traditionally used to display a large piece of art. This works well if the artwork is in scale with the size of the wall space. If your room has a soaring two-story ceiling, it may be difficult to find a piece of art large enough to fill the space. Consider creating a grouping of items instead. You can hang a group of smaller paintings or mirrors, several architectural finds, a few quilts, or colorful plates and platters. By giving your fireplace special attention, you can create a beautiful space and a warm gathering spot for family and friends. Brown is one color that never really goes out of style. 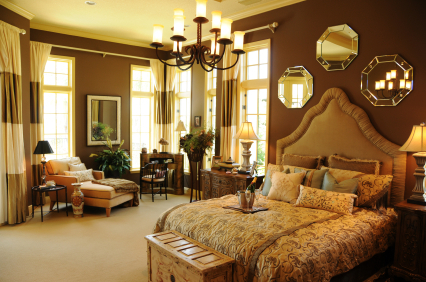 Although the shade of brown that you choose can make or break a room. Brown is a warm, safe color that encourages conversation. It’s a great color to use both in public rooms, where you entertain guests, and private rooms, where you retreat to feel relaxed. Chocolate brown has been popular for a while, but now the trend is changing, as lighter, richer browns begin to make an appearance. We're seeing browns shift to the shades of spices and beverages. Think rich coffee bean, cognac, and cinnamon! These tints of brown are being paired with interesting colors - like stonewash blue, desert sage, and silver pink, creating eye-catching, beautiful combinations. If you are looking to add an accent or create a bold statement, choose metallic shades of brown, like copper and bronze.For more natural looks, use beige shades, like the colors of parchment, cardboard, muslin, and hay. There is nothing more important than the safety of your family. Luckily, today’s design products make it easy to create a beautiful home that is also safe. This month is National Window Covering Safety Month, and I want to take the opportunity to remind you and make you aware of important information so you can keep your children safe from potential window-cord hazards. I urge you to read the article below, and follow the basic safety tips. Wishing you safety and beauty! After a summer packed with sun and outdoor fun, we’ll be spending more time indoors. But that doesn’t mean our environment has to be any less cheerful. 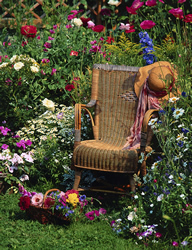 One of the easiest ways to change the feeling of a room and add outdoor freshness is with color. A bit afraid of choosing the wrong color? Not after you read this month’s feature article. Also check out the color of the month. Yellow is a sure way to add sunny warmth to a home. It’s a great time to add color to your home... and your life! Color is such an important part of making a home feel great. But it can be a bit scary to make color choices – unless you know a few simple tips. Avoid these common mistakes and learn several tricks, and you’ll feel confident about choosing color for your space. ...choose colors in a paint store. Colors change drastically depending on the light, so they can look very different in your own home. When deciding on colors, make sure to look at them in the space they will be used. ...forget the ceiling. A white ceiling may be the best choice, but don’t just leave it white by default. A room looks much more finished when the ceiling is deliberately painted to coordinate and harmonize with the décor. ...ignore accessories. While paint is the most common way to add color, don’t forget that incorporating pillows, fabrics, area rugs, and other accessories is a great way to add splashes of color – and unique personality. ...understand the psychology of color. Colors evoke reactions in our bodies and affect us physically and mentally. When you understand how colors shape your feelings, you can choose ones that help you feel wonderful in your home. ...create flow from room to room. In most homes, you can stand in one room and see other rooms, so there needs to be a smooth continuity. Not all rooms should be painted the same color, but the colors need to work together. Carry elements of one room into another. 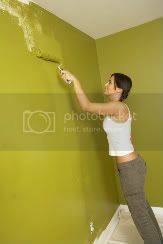 The easiest way to do this is to paint the moldings all the same color. ...use inspiration. If you have a large piece of furniture or a treasured accessory, let it awaken your color creativity. The background color in a piece of art can become your wall color; a favorite antique can inspire the color for pillows; a lampshade can become the molding hue. The most important thing to remember about color is that it should make you feel good. So be courageous and pick some color! The cheerfulness of yellow has made it a popular choice for clothing and interiors, especially this time of year, when the days are getting shorter. There are so many shades and tints of yellow that it can be used in almost any room. A soft shade of yellow can bring cheer and light to a dreary room. But beware of bright yellows - except in small amounts. The intensity can be overwhelming. 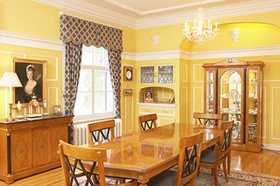 A room that is painted all bright yellow can cause turmoil, anger, agitation, and hostility. Small doses of bright yellows added to a room with accessories add punch, cheerfully catch the eye, and make rooms feel lively. When using the color yellow, think of natural sunlight . Soft, warm rays have a soothing and uplifting effect, while bright, hot rays can cause discomfort and disorientation. Have you ever wondered about Feng Shui? What is it? 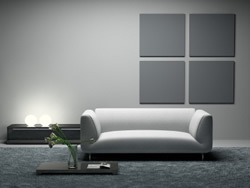 Does it really improve a home’s atmosphere? How does it work? This month’s article gives you the basics of Feng Shui, so you can begin to understand how to incorporate it into your home. Think about what type of energy you’d like to have in your home, and see which elements help you achieve your goal. And add some more relaxation to your summer with the color BLUE. Hope you’re enjoying the season! Improve your environment and improve your life! That is the simplified idea of what Feng Shui can do for you. We know that we feel better and operate more effectively in the right atmosphere. Becoming aware of the basics of Feng Shui will help you correct areas in your home that aren’t working for you, and allow you to create the right environment for you and your family. 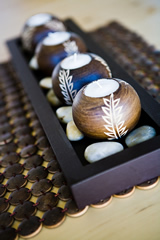 Feng Shui incorporates five elements: wood, fire, earth, metal, and water. Each element invokes a different mood or attribute. When you incorporate all five elements into every room design – enhancing specific elements according to your unique objectives, you can create a customized space that is beneficial for your family’s personal needs and goals. Wood represents the rising sun. It has an active energy, and it evokes the power of creativity and expansion. You can use wooden objects to promote motivation, inspiration, and passion. To add more wood energy to a room, use vertical shapes. Fire is seen as the most powerful of all the elements. Fire represents energy and passion. To increase the fire element in your space, add candles, animal prints, and shades of red, pink, and purple. Earth / Soil resembles the secure energy of the setting sun. It generates an overall feeling of balance and stability. If you feel disorganized or unfocused, your space could use some earth elements. Look for anything in earth tones, and use images of calm landscapes. Metal affects mental clarity and logic. The right amount of metal in a room can help you feel organized and focused. To enhance a space with the metal element, choose round or oval shapes; use white, gray, or silver colors; and use metal materials, like steel, iron, or aluminum. Water influences spirituality and emotions. A balance of water brings about inspiration, wisdom, and insightfulness. 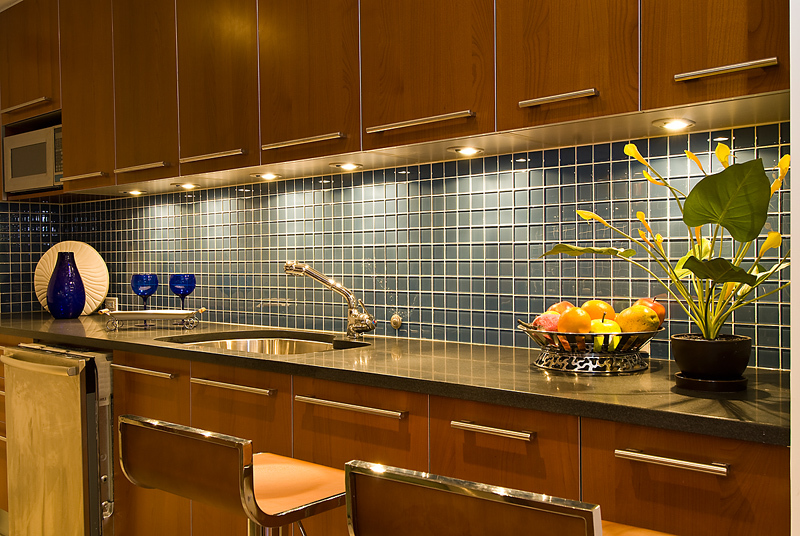 For water energy, add deep colors, reflective surfaces, and wavy shapes. Water features, such as aquariums and fountains, also work well. With the understanding of the basic characteristics of the Feng Shui elements, you can begin to design your home in a balanced, comfortable way. Play around a little, adjusting your rooms until you create the perfect atmosphere for you. So you have a bouquet of fresh flowers. Now what? You can keep the bunch together in a single vase, or take it apart and bring nature to every room in your house! Choose a single, large bloom and clip off the stem. Float the head in a wide-mouthed vase filled with water. Baby’s breath looks fabulous on its own – if you use lots. Secure the stems with floral wire or rubber bands to keep the bunch crowded together. This throng looks rustic and cheerful in a tall vase. Put simple, pale flowers in brightly colored containers. The contrast is beautiful. Cut stems of blooming flowers very short, and stuff a bunch of them into a low, square container. This over-stuffed grouping looks great on a side table. 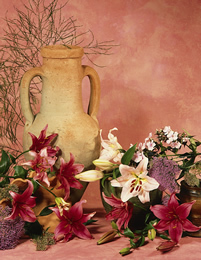 Pick a single, tall bloom (like lily or ginger), and cut the stem very short. Stick the flower in a bud vase so that the bottom part of the head is stuffed down. It will look as if it is blooming right out of the vase. Use unusual containers. 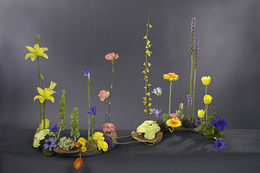 Create a whimsical floral arrangement in a shoe. Grab a tin can for an outdoor garden look. Any container that holds water can be used to display your flowers. Have fun with this. Arrange multiple small glass jars in clusters, and place a single flower in each. Display the whole arrangement grouped together in one space. Having a party? You can put a flower at each place setting. Use single bud vases, or float the head of a flower in a wide martini glass beside each plate. Pull off the petals of a flower, and hot glue them around a candle. This candle can be displayed alone on a table, atop a bunch of tossed petals, or in the center of a bouquet of flowers. Tie a bouquet together at the stems, and hang it upside down. When the blooms dry, use raffia to decorate the stems. A dried bouquet looks pretty resting on a book on a shelf. Green is associated with nature, and so it is calming and restful. In fact, green is one of the most restful colors. It reduces activity of the nervous system and relieves muscle tension. A green room will promote balance, stability, and security. It is a wonderful color choice for bedrooms and living rooms. As always, don't go crazy with one color. Too much green is thought to make people too complacent or laid back. To counteract these feelings (and to add real drama and flair), add splashes of red or orange. 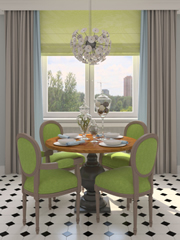 Green is a creative option to use as a neutral, in place of the traditional creams and tans. As you can see by looking in a florist’s window, green goes well with almost any color. Need to spruce up your bathroom? 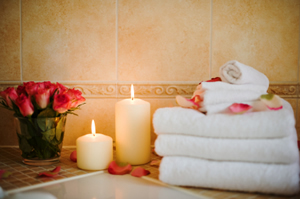 These quick and easy ideas will turn a “blah” bath into a guest-ready space in no time. A colorful shower curtain will add a big splash to a neutral bathroom. 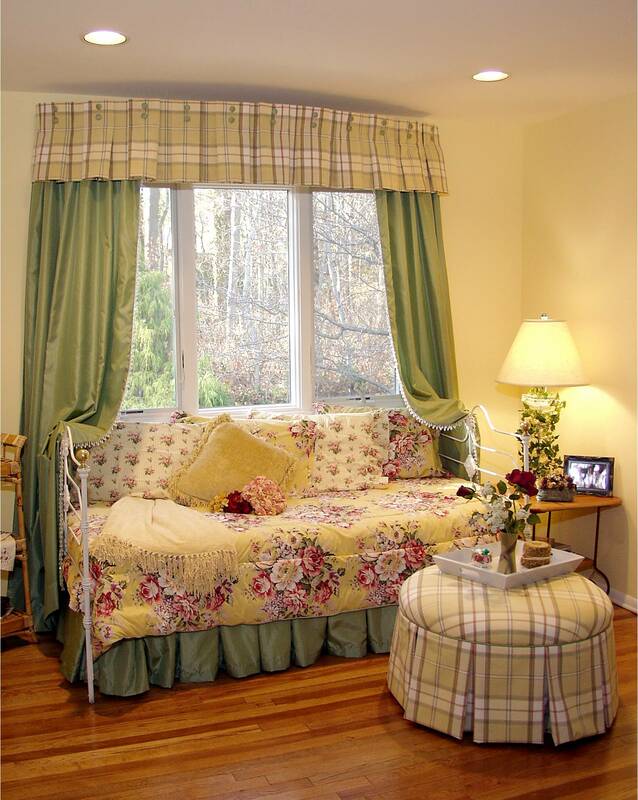 Add a few accessories that coordinate with the pattern in the curtain, and the room will feel instantly transformed. Instead of simply hanging towels on the traditional wall rack, display yours in unique ways. Roll a few towels and place them on an open shelf or in a basket. Stack folded towels on a decorative chair. Present them on a silver platter. Your towels will become part of the artwork in the room. You don’t need to stick with the flat “builder’s” mirror. Choose a decorative mirror with a frame suitable to your bathroom’s style. There are so many shapes, sizes, and styles to choose from, so don’t limit yourself. A bathroom can take on an entirely new look when you simply change your cabinet knobs. You can go bold and colorful to make a statement, or choose elegant shapes and finishes to coordinate with the existing fixtures in the room. A vase of fresh flowers is the perfect bathroom accessory. Cut fresh blooms from the garden, or purchase a nice bouquet when guests are coming over. This will not only add a splash of color and a lovely scent, but will evoke a cheerful mood. Although these ideas are simple, they make a big impact. So take a little time to update your bathroom. You’ll love your guests’ reactions. Pink is often associated with love and romance. But as romantic and loving as a man may be, he is probably not going to be comfortable in an all-pink room. This has more to do with gender stereotypes than the actual psychological effects of pink. The color pink evokes feelings of comfort. It soothes, calms, and heals. Pink is most popular with little girls. But this color can be used as accents in many rooms of the home. Pair pink with black for a fresh, contemporary look. 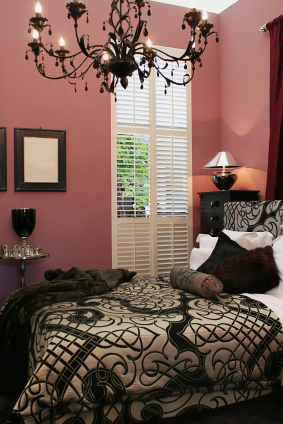 Add splashes of blackberry pink to a brown room for a dramatic feel. Deep red-pinks are great for the dining room because they increase the appetite, making food taste better. Refined, sophisticated versions of pink can be very comfortable for both men and women. Look for shades like puce, currant, and soft raspberry. Craving a new look in your living room or den? There is no need to replace all the furniture. For a quick makeover, you just need to add some pillows. It’s amazing how updated and fresh a room can look by simply changing out this one accessory. Pillows run from simple to extravagant, and the style you’ll choose depends on the look of your sofa. 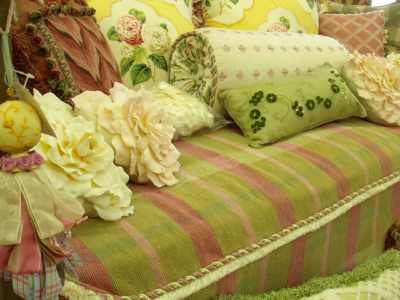 If you have a solid or subtly patterned fabric on the couch, you can go bolder in the pillows. For a busier sofa, choose one color in the pattern and highlight it by getting solid or tone-on-tone pillows in that hue. Pillows come in every shape, from the common square or rectangle to the more exotically shaped oval. You can even get pillows custom-shaped to highlight a theme in the room or bring out a shape in your sofa’s pattern. For additional seating in the room, scatter oversized pillows around the fireplace or coffee table. This adds to a cozy, relaxed atmosphere. Adding attractive accent pillows can also give old chairs a new appearance by hiding deterioration, adding texture, and giving the entire room a splash of color. Choose fluffy, comfortable pillows, and an old chair can become your new, favorite resting spot. Don’t be afraid to mix shapes, sizes, and patterns. Contrasting shapes, colors, and sizes is what brings interest and excitement to a family room. Pillows, of course, also finish off a beautiful bedroom. 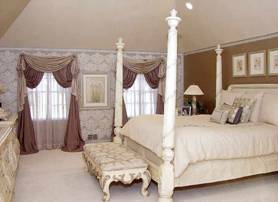 Decorative shams, pretty pillowcases, and coordinating accent pillows are an impressive part of an inviting bed design. Mix and match with your comforter, dust ruffle, and accent throw. Would you like to know the designers’ secret for plumping a pillow? Gently slap the right and left sides, and then give it a swift karate chop to the top for definition. Redecorating a room is quick, easy, and fun when you use pillows! Ahhh... what a dainty color lavender is. 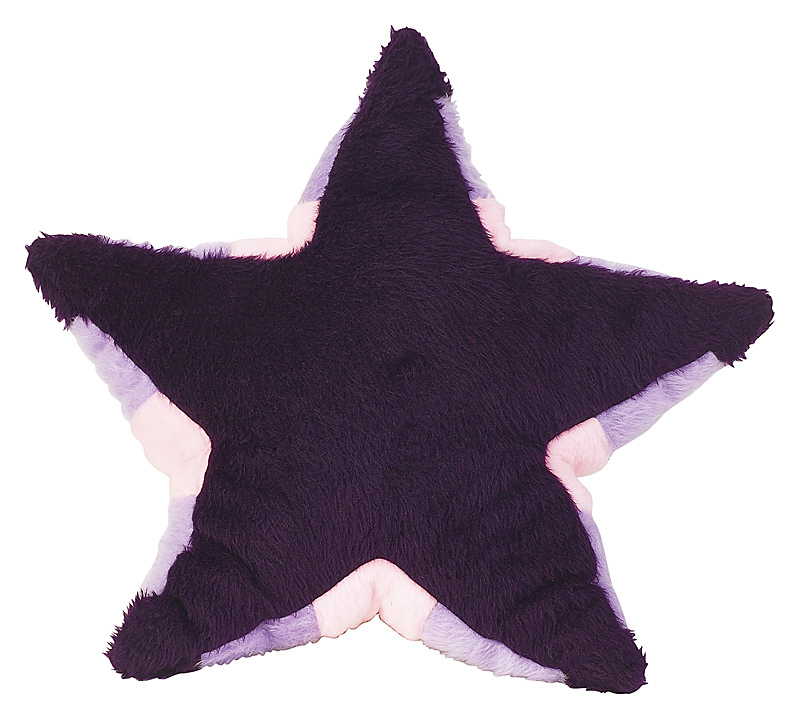 This shade of purple is very popular with little girls. But it can actually be very flexible. Subtle tints of lavender can be used as an exciting neutral - for moldings and ceilings. Saturated purple shades provide a vibrant punch of color to a room. You can create many moods using various shades of purple. Blue-purples, the shade of a summery sunset sky, relax the body and are perfect for a bedroom. Red-purple, like eggplant, creates drama and excitement. Deep purple evokes the sense of royalty and richness. And as you can see in this photo, lavender velvet can be quite luxurious, elegant, and romantic. Want to Add More Romance to Your Bedroom? When you think of love and passion, you probably think of red. Red does stimulate the libido by increasing your heart rate and breathing, but a lot of red may make you too passionate. 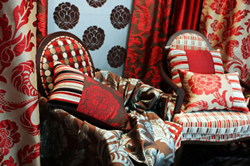 A room that is all red can make you feel angry and agitated – not great feelings for igniting romance. So use red sparingly, as accents in the bedroom. 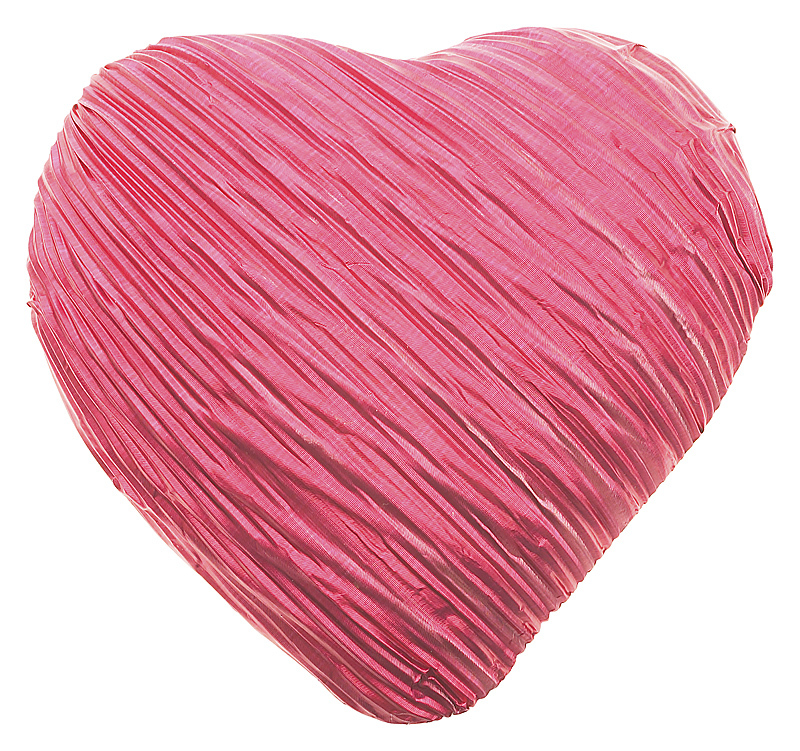 The most romantic and soothing color is pink; however, it’s the least preferred color among men. Shades close to pink, like mauve and lavender, are nice compromises that evoke romantic feelings in both women and men. Soft blues are very soothing and romantic, and because they slow your heart rate, they can help you get a great night’s sleep. A room decorated completely in shades of white is also ethereal and dreamy. Combine luxurious, sensual fabrics in rich textures – like silk, chenille, and linen. Make your bed with high thread-count cotton sheets; a full, down-filled comforter; and loads of fluffy, soft pillows. 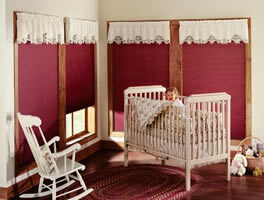 Cover your windows with full, neutral-colored, sheer fabric panels that appear to be blowing in the breeze. Soft lighting is essential for a romantic mood. During the day, your sheer window panels filter the sunlight, creating a warm, intimate glow. In the evenings, use light sources from all directions, and not just from overhead. Turn on side table lamps softened by lampshades, use up-lights near plants or fabrics to create shadows, and put your overhead lights on dimmers. Candles are, of course, great for romance, but be extra careful near your flowing fabric. Set the perfect romantic mood by taking all of your senses into account. Soft music, sachets and potpourri, fresh flowers, and a large bowl of plump strawberries will all add to a romantic ambiance. The next time you think about injecting more romance into your bedroom, skip the advice columns and do it through decorating! The Color of Love... red is a very intense color. Used well in decorating, it can create a wonderfully dramatic room. Red stimulates the body. It accelerates heart rate and breathing, and increases appetite. 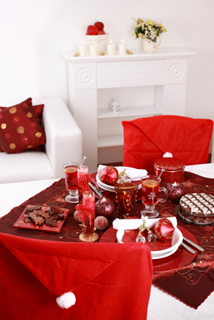 Red is a popular color for dining areas because, since the appetite is stimulated, food tastes better. 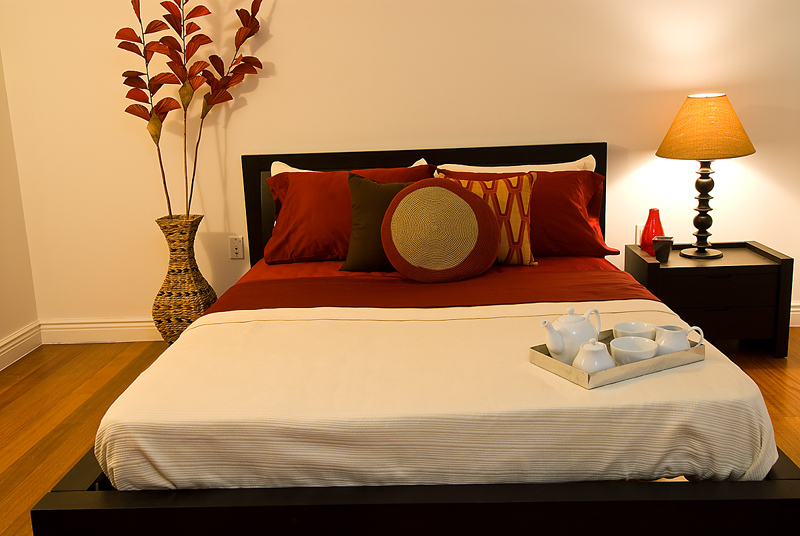 Red should be used sparingly in the bedroom due to its intense nature. The body has a hard time relaxing around a lot of red. In a room that has a serene color scheme, red furniture or accessories can provide a strong focal point and add a youthful excitement. Decorating with red takes confidence. But while it does make a bold statement, red is also a warm, easy-to-live-with color. With such an enormous selection of fabric available, how do you know which to choose? To make sure that your design project is successful, it is essential to know which type works best for your specific function. This natural fiber is a popular choice for home décor projects. Cotton comes in many finishes to coordinate with most room styles. It works well for window treatments, as it hangs nicely and usually keeps its shape. Prolonged exposure to sun can cause yellowing, so use a lining for protection. Cotton is also a good choice for slipcovers and smaller accessories because it launders well. Silk has a beautiful, luxurious sheen, and is available in a wide variety of textures and rich colors. It is a fragile fabric, so it is usually avoided on upholstered furniture. It is very susceptible to staining from moisture because it absorbs all the impurities and causes spots. Silk is best used on pillows and draperies. Sun and heat does cause silk to fade quickly, so use lining and interlining to protect window treatments. This manufactured fiber is a good choice for many home décor projects. It is often woven to resemble natural fibers, like silk or leather. Polyester needs less ironing than natural fabrics, and it resists sun nicely, so it is a perfect choice for window treatments. Because it is resistant to wrinkles, it also works well for upholstery and cushions. Many fabrics come as a blend of polyester and another fiber, which gives you the best of bothmaterials. Leather adds a rich touch to a room, but it does require work to keep it looking good. It is often used for upholstery. Leather fades quickly from the sun, so don’t keep it close to big windows. This synthetic fabric is very strong. It is usually blended with other fibers, and adds a silky shine. It’s strength and resiliency makes nylon and nylon blends good choices for upholstery. But because it is very heat-sensitive, it is not recommended for draperies. Choosing the right fabric and following the proper cleaning and care guidelines will enable you to enjoy your furnishings for years to come. 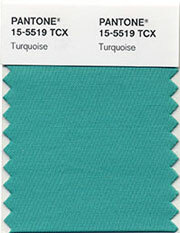 Pantone – the global authority on color – has announced Turquoise as the color of the year for 2010. Turquoise combines the serene qualities of blue and the invigorating aspects of green, making it inviting and luminous. It evokes thoughts of soothing, tropical waters and a clear, bright sky. Turquoise is relaxing and healing, restoring our sense of wellbeing. Because it is a very vibrant color, designers are using turquoise mostly as an accent, rather than as a main hue for the room. With both warm and cool undertones, turquoise pairs nicely with any other color in the spectrum. Turquoise adds a splash of excitement to warm neutrals, like browns, creams, and golds. Create a classic maritime look by pairing turquoise with deep blues or white. For an exciting and unexpected look, combine turquoise with tangerine, purple, or gray. Hollywood Glamour is coming back to home décor. The modern version of this 30’s style – which was a favorite of Joan Crawford and Nancy Reagan – is surging in popularity. The Hollywood style is over-the-top, with many accents of glitz and glamour. Think of a space that is alluring, thrilling, sophisticated... gorgeous! It’s a very rich look. But you don’t have to spend rich to get some Hollywood elements in your décor. Going “Glam” is all about details. Add embellishments like fringe on lampshades and jewels on chandeliers. These details may seem small, but a few of them in a room add a great deal of glamour. Purchase one mirrored piece for the room. 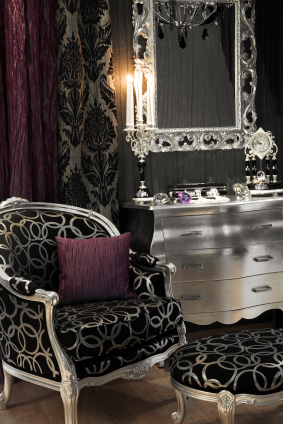 Mirrored furniture adds a striking touch to a Hollywood style. You can find side tables, coffee tables, armoires, and even upholstered stools highlighted with mirrors. Look also for tables in lacquer and Lucite. Choose luxurious fabrics. Velvet is a great choice for sofas and drapery panels. Silk is perfect for furniture, pillows, draperies, and lampshades. Make sure your carpet is thick and lush. Introduce bold colors. The Hollywood Glamour style is certainly not shy. Rich, hot reds and dramatic shiny black are very popular. Color is a great place to start if you love this look. Simply by adding vivid colors, you can achieve a striking Hollywood feel. Mix and match. One fun part about this style is that you don’t have to worry about everything matching. It’s meant to be an eclectic mix of styles. While you are mixing together your different pieces, though, don’t forget that the overall theme – and your coordinating element – is luxurious glamour. The Hollywood style is from an era where people really wanted to impress each other with their homes. Adding anything showy into your decorating scheme will give your home the sense of glamour that is just so “Hollywood.” But today’s version is more elegant and subdued. What is big in home décor? Greys – in every shade! From cool, soft “chalky” gray to dramatic, deep charcoal, grey is the perfect color choice for creating a chic, new look in your home. The greatest thing about grey is that is goes beautifully with every color. Grey is the new neutral! Pair it with any color in the spectrum, and you’re sure to create an elegant, sophisticated look. Accent your grey with white for a clean, classic style. Add a splash of yellow to create a cheerful, yet tranquil mood. Use purple with metallic grey for a dramatic modern vibe. Red adds a bold sense of excitement to a grey room. You can go soft, or go bold. But don’t be afraid to go grey! One of the quickest ways to transform the look of a room is by changing your cabinet hardware. Cabinet hardware provides the finishing touch to cabinets and drawers, and can also add a spark of color and style. For a new look, you can update your entire kitchen or bathroom, or simply replace the hardware on one piece of furniture in the living room. There is an unlimited variety of styles, shapes, and colors available for drawer pulls, cabinet knobs, and door handles. But the most important consideration in selecting hardware is function. Make sure that the handle you choose will be comfortable to use. If a drawer is very heavy, it will require a substantial pull. Look for hardware that matches your style. If you have an Old World look, avoid shiny finishes, and opt instead for materials like crackled porcelain or rubbed metals. Do you prefer country? Drawer knobs come in fun shapes like pigs and roosters. For contemporary designs, stainless steel and satin nickel are good choices. Sometimes changing the hardware on one piece of furniture can update an entire room. Update the wall unit with new pulls and handles, and it will look like you bought a brand new piece. 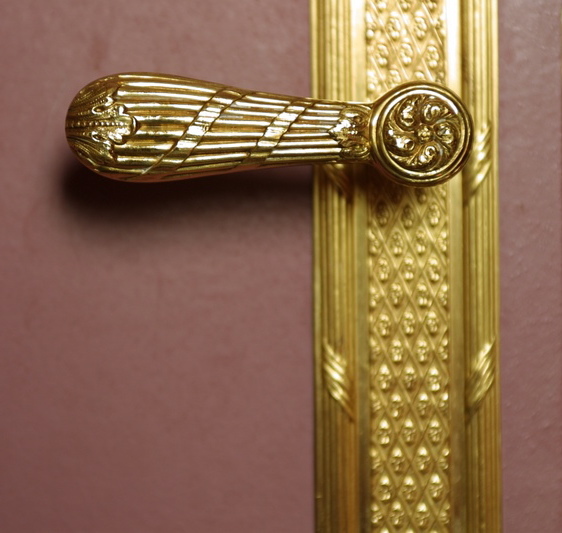 You can actually create a focal point in a room using unique hardware. Look for contrasting colors, unique shapes, and whimsical themes. For a fun, eclectic mood, mix different designs of hardware in one room. To keep the harmony, just make sure one element matches (color, shape, size, etc.). Hardware is a wonderful way to express your personality in a functional way. It’s great when a simple idea makes such a big difference. By adding the latest cabinet “jewelry,” you can quickly give your room a whole new look! to me! If you are looking to add an accent or create a bold statement, choose metallic shades of brown, like copper and bronze. For more natural looks, use beige shades, like the colors of parchment, cardboard, muslin, and hay. Yes, copper is cool. And right now, it's hot! Metallic finishes are a great choice for fall home décor - especially muted metallics, which have the sophistication of their shinier counterparts, but are much easier to live with. The reddish brown hue of copper evokes a comfortable, warm atmosphere. In terms of impact on the body, copper soothes and inspires confidence. If you are feeling overwhelmed and stressed out, you could benefit from adding copper color to your home. Soft copper can be lovely in a living room or den. Because this color inspires conversation, your friends and family will feel comfortable hanging out and talking long into the evening. Copper is also great to add as an accent. You can add a bold copper sculpture, fabrics with a copper metallic print, or a trim with copper beading. Today’s bedroom design gives us many options for supporting our personal style and creating a peaceful, calm mood at the same time. No matter your style, you can implement some simple ideas to make the space sensational. If you like a formal mood, dress up your bed with lush, rich shams. Go for tapestry, jacquard, or chenille shams trimmed in even pleats, loop or tassel fringe, or a contrasting flange. An eye-catching bed skirt that puddles elegantly onto the floor will give added formality. If you prefer a casual atmosphere, choose dense ruffles on European shams and throw pillows, and a soft cotton folded coverlet. Accent the bed by tossing a simple, comfortable throw. If you are wild for a modern environment, use clean lines on the bed. Deliberately leave space around furnishings, giving every element room to breathe. Embellishments should be left to a minimum. Use simple, quality fabrics in muted, solid colors or understated patterns. Throw pillows should be very few in number. Modern bed skirts must be tailored, if used at all. Choose colors that serve you. Green is associated with being calm, refreshed, and renewed, and it promotes healing. Green helps relieve physical and emotional tension, relaxes the muscles, and refreshes tired eyes. Blue also relaxes and refreshes, and produces feelings of peace. Blue is so meditative it can actually make you lose track of time! Green and blue are cool colors that help to restore depleted minds and bodies. Both slow the pulse rate and lower blood pressure, and are perfect for the bedroom retreat. On the other hand, hot colors excite the body and mind. Red, for instance, raises the blood pressure. This is great for romance, but not so great for a night of rest. Choose predominant colors that calm the spirit, and add a few accents of hot color for a bit of contrast and excitement. Take the TV out of the bedroom. Purchase the best pillows and linens you can afford. Create your own Dream Bed. To soften lines, replace night tables with upholstered ottomans. Add an inspirational book or two to your new bedroom ottomans (or night tables). Replace overhead lights with a chandelier for instant luxury. Let your bedroom become the space that pampers your body and mind. Purple... the color of royalty. Years ago, it was very expensive to make purple dye, causing it to be a color that only nobles could afford. Thus, purple evokes feelings of luxury, wealth, and sophistication. You can create many moods using various shades of purple. Blue-purples – the shade of a summery sunset sky, relax the body and are perfect for a bedroom. Red-purple, like eggplant, creates drama and excitement. Deep purple evokes the sense of royalty and richness, and is said to stir up creativity. Because purple is rare in nature, it can appear artificial. 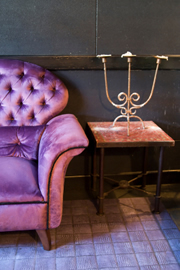 But although it isn’t “natural,” saturated purple shades provide a vibrant punch of color to a room. Ahhh... the sound of the waves; the smell of the ocean air; the warm, comforting breezes. Life at the beach is heavenly. But you don’t have to live on the ocean to enjoy a relaxing beach atmosphere in your home. Try these easy decorating ideas to transform your living space into a beach retreat that you can enjoy all year long! Choose light, gauzy drapery panels for the window, and make sure you install them at least a few inches above the window frame. Soft, sheer, flowing panels give the impression of gentle breezes with lots of sunlight entering your room. Use beach souvenirs as artwork. There is nothing more “beachy” than seashells. Starfish are also particularly beautiful. And don’t forget sand dollars. You can combine all of your beach finds in a large bowl, scatter them on a table or shelf, or position one unique piece by itself – on the wall or a shelf – as a focal point. Select summer colors for your walls. Soft blues and greens will remind you of the beach. Buttery yellow is great to mix in. Keep your trim white. Moldings, chair rails, wainscoting, and other accent panels should remain white for a clean, summery feeling. Speaking of white... you can create a terrific beach mood by opting for all white accessories. 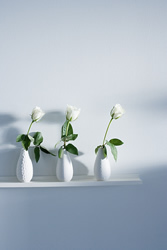 On a white shelf, display your white china, white vases, and white candlesticks. On the wall, hang your family photos in white wooden frames, and intersperse some white starfish. If you have wood floors, scatter a few sisal rugs. Your feet will enjoy the natural, beachy sensation. Go nautical. There are lots of great nautical accessories that can be added to your home. Lean a ship wheel on a shelf. Hang a wooden anchor on the wall. Choose anything that reminds you of the water. Go for beach-inspired patterns. Stripes are always great, especially if they are in blues, greens, and whites. Wave patterns, of course, create an “oceany” atmosphere. Enjoy beach living all year long! Just when you were getting all excited about adding lots of color to your home, WHITE comes back on the scene. Now as you see in this photo, decorating with white does not mean you must create a sterile, cold atmosphere. In fact, creamy shades of white add to a cozy, warm atmosphere. Use neutral white as an accent to make your other colors "pop." Paint all your moldings white for a clean, fresh look. Blend shades of white and use various textures to create an elegant, sophisticated room. And don’t forget – if you want to create that beachy atmosphere, use white accents in accessories, wainscoting, and gauzy fabrics! This month is all about GREEN… decorating using the color green and creating an eco-friendly environment in your home. Going green is one of the hottest trends in interior design. Not only does it reduce the amount of garbage in our landfills, but it can be a less expensive design option, as well. Many people ignore the idea of going green in the home because they don’t know where to start. This month’s article gives you three easy things you can do to create a healthier, safer, more beautiful home, while being good to the environment at the same time! Green design is forging ahead, and it makes a big difference for all of us. Using sustainable resources in home design will go a long way in helping Mother Earth. Many people get uneasy at the thought of going green in the home, simply because they do not know where to start. Here are three simple things you can do to join the ranks of those who take action for a better planet – AND a lovely home! 1. Re-Use, Re-Cycle, Re-Design Consider re-designing instead of buying all new home furnishings. Re-designing can make your former furnishings come to life in a powerful way. You can hire a professional re-designer – who is skilled at restyling what you already own, or try rearranging just one room yourself. You will be surprised at what a new look can do to lift your mood. Re-design is a cost-effective way to be good to the planet. Many responsible companies are helping us shop wisely, saving everyone money and resources. Look for packaging that informs you of recycled materials used in the manufacturing process. Even if only some of the product’s materials are recycled, it will make a big difference. By substituting some of our often-used household products with more eco-friendly versions, we can make the Earth a happier place. Use interior paint with low VOC (volatile organic compounds). These paints are better for the environment, and they don’t leave behind fumes or a bad smell. Instead of using the typical incandescent light bulbs, choose compact fluorescent bulbs, which are much more energy efficient. Wait until your regular incandescent bulbs burn out, and replace them one at a time. The EPA (Environmental Protection Agency) suggests that compact fluorescent bulbs will last 10 times longer than the typical incandescent, and use about 2/3 less energy. On a pretty day, opt for the clothes line instead of the dryer. Swap your napkins and paper towels for cloth napkins and kitchen towels. After washing, hang them out on your new clothesline. Look around for ways to substitute everything with more responsible choices that won’t take away from your style of living. Some choices will even add to it!